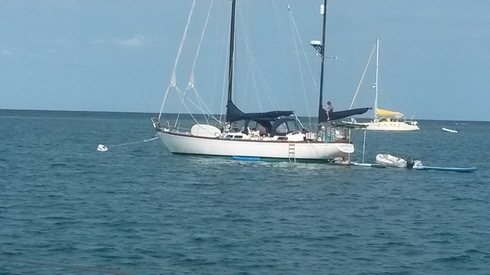 Norm has been in the Caribbean since early December. He files this report. Haha. 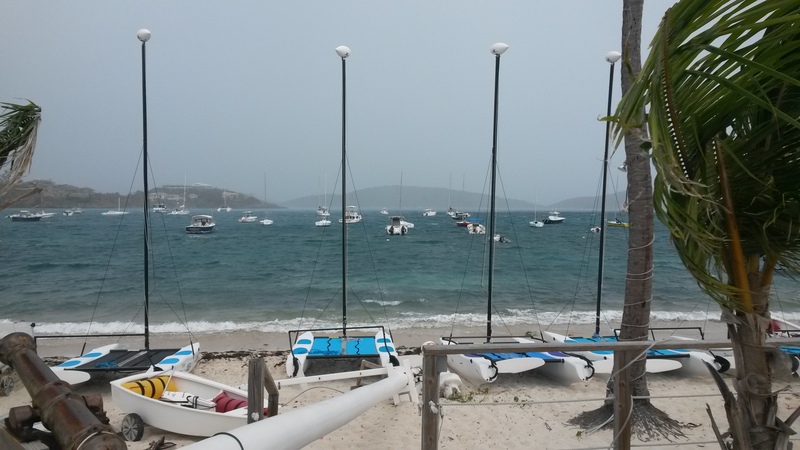 I have been in the USVI, BVI, and Antigua. It is interesting to see the effects of two Cat 5 hurricanes, Irma and Maria, on the USVI and BVI. Widespread destruction hardly describes the scene. 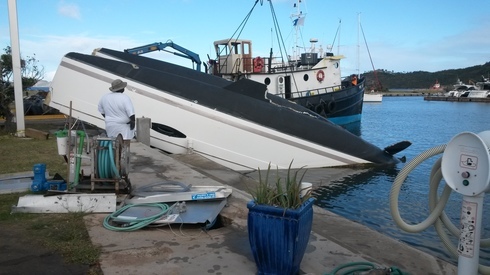 In boat yards, my normal venues, boats tipped over and flipped over. The recovery is interesting to compare. The USVI allow mainland workers and their equipment in immediately and FEMA covers most expenses. Or so they say. 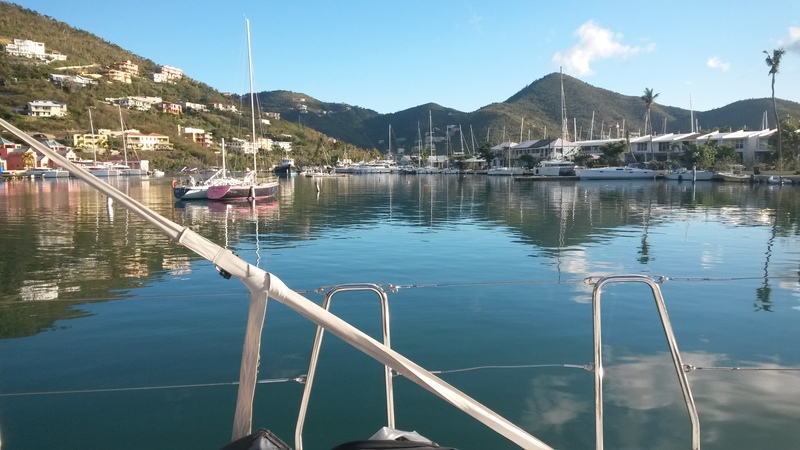 In the BVI. There are few workers from outside and much less money. The place is still beat up, depressing. The recovery is being undertaken by the population of 25-30,000 people. Not enough workers. Not enough money. Some images from around the areas. The sailing remains excellent. 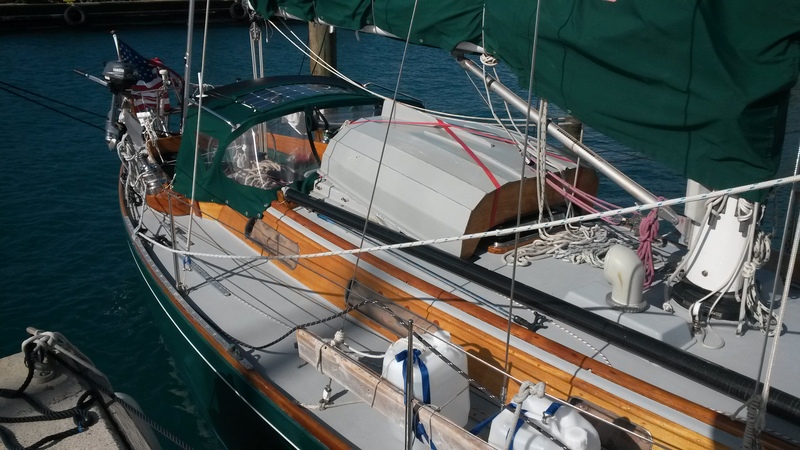 The boats that are up and running are sailing and the sailors are excited. 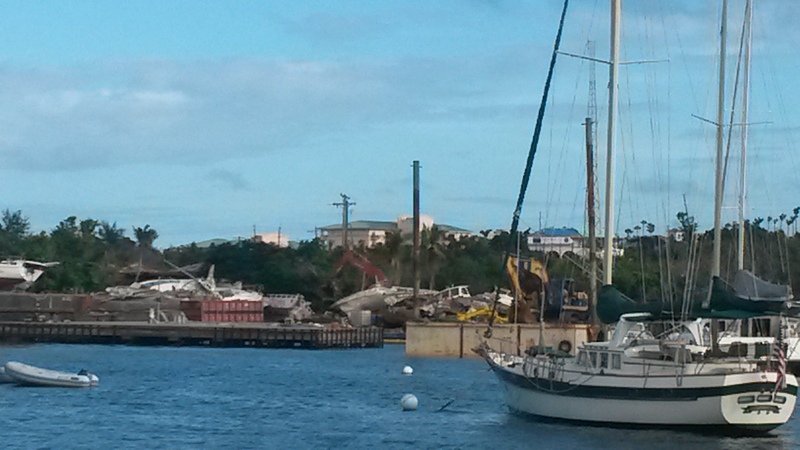 Wrecked boats lifted from beaches and placed on barges destined for a scrap yard somewhere. 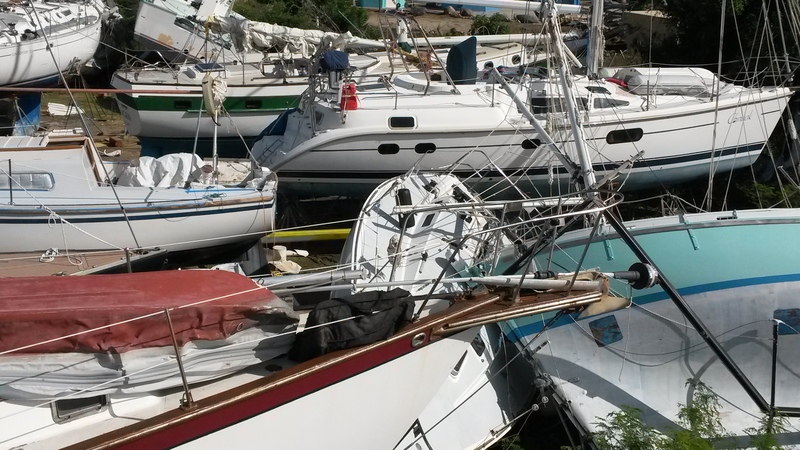 hundreds and hundreds of sailboats are junk. The USVI cleaned up pretty quickly. Cowpet Bay off the yacht club on a very pretty day. Great St James Is in the background. 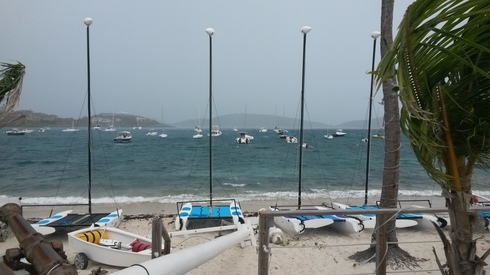 View from St Thomas YC looking East into a coming squall. Some days in this winter the squall obscured St.John Island in the distance. Dave Franzel, formerly of Boston Sailing now of St Thomas Sailing Center showed some images of his IC24 fleet after the hurricanes. All those boats are floating and sailing now. Thanks, Dave. What a mess. 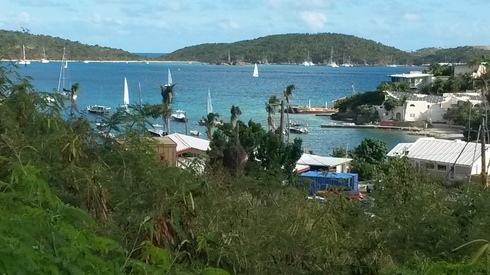 Spainish Town Marina on Virgin Gorda. So.. what pick s up a 20,000 plus pound catamaran and flips it up onto a seawall as if it were a pancake? It took all day to lift it off the seawall almost five months after the storms. Nanny Cay Marina. Empty. 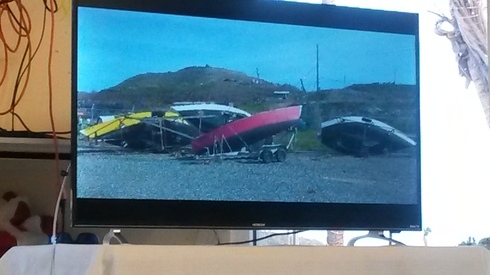 Boats still under water. This scene was once a hundred plus yacht marina with concrete piers and bustling life. 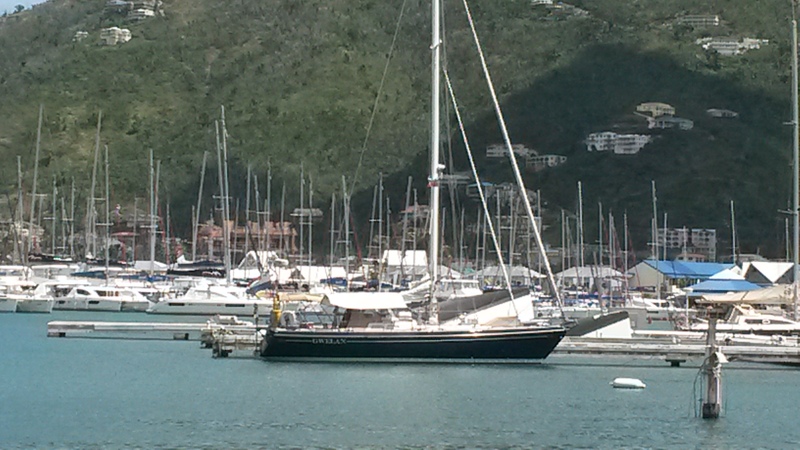 A beautiful Dutch yacht in Village Cay Marina, Tortola. 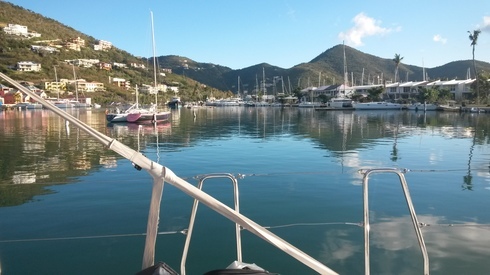 Mooring Base is behind. 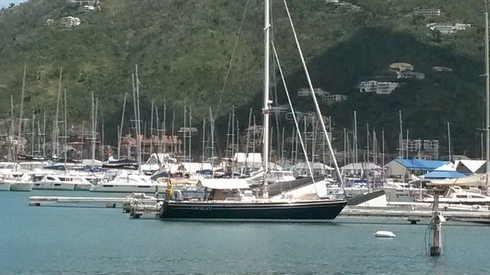 Find the monohull? Sadly sunk and wrecked yachts litter the shoreline. 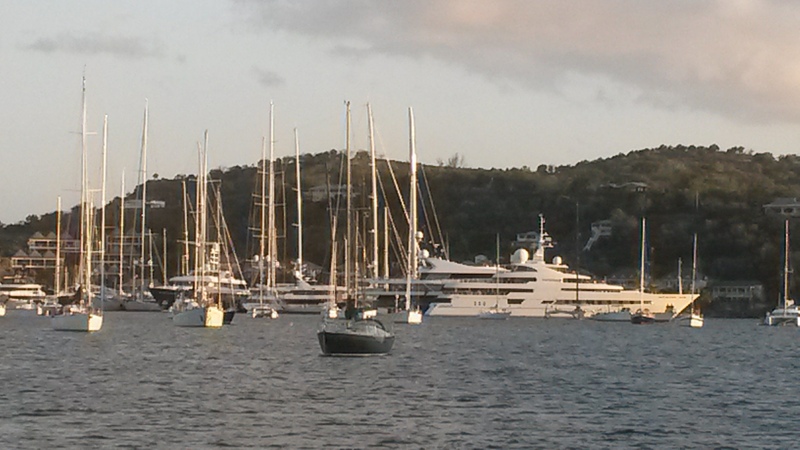 Falmouth Harbour is always able to show off some of the finest in yacht design. 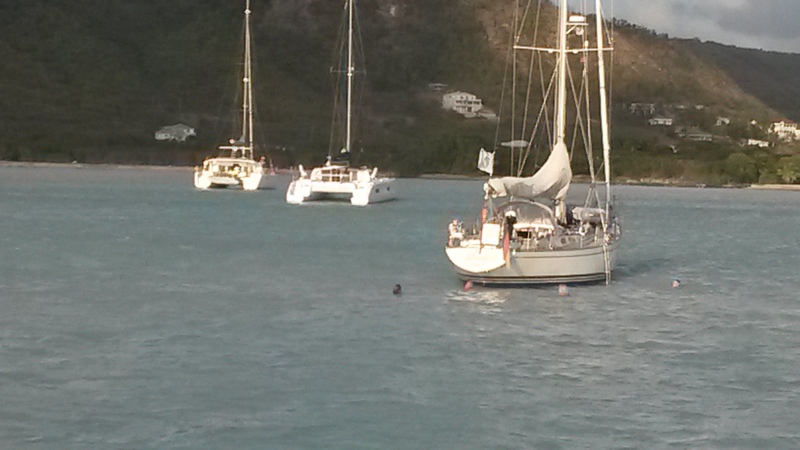 Anchored out are small sailing vessels of every description from all over the world. 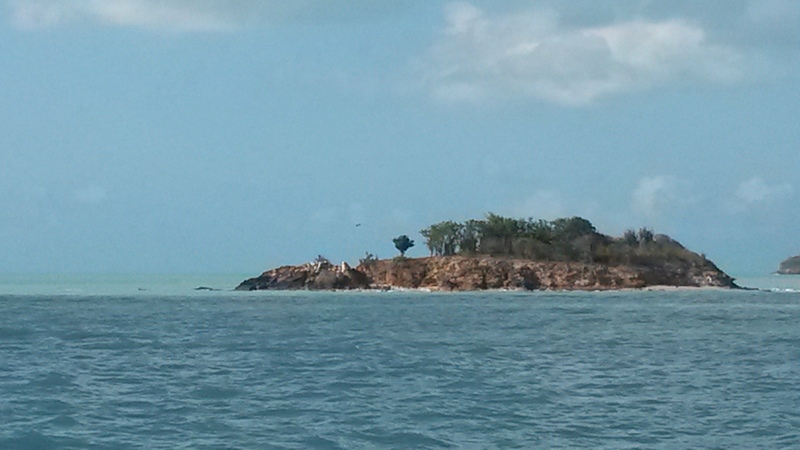 A Hood 50, Caradow, anchored behind the reef at Green Island on Antigua's East Coast. The family has a bunch of kids and they sail around in a little Dyer Dhow sloop visiting their friends on other yachts. those kids are paddleboarding and sailing around the harbor. I only thought about how much our grands would fit in to this life. A pretty Swan 48 and two ugly catamarans anchored off Jolly Harbour. Cats are taking over and power-only cats are surging in popularity. The Swan is what a boat should look like. Averisera is from the same designera and just as pretty. Seaworthy, too.